The decision to file or not to file bankruptcy in Massachusetts or New Hampshire can be a complicated and an extremely difficult one to make for an individual or family. The stigma of bankruptcy often prevents people from finding out the facts or simply believing the many myths out there. If you are considering bankruptcy or simply want to be more informed about what bankruptcy may mean for your individual situation, the Massachusetts bankruptcy lawyer at the law firm of George C. Malonis can answer your questions, help you decide the best course of action, and help you navigate the process if you decide to file bankruptcy. While the intricacies of filing for bankruptcy can be complex, there are a few common questions and answers that can help most people make a more informed decision. If I file, what happens right away? Once you decide to file and let us guide you through your bankruptcy, your creditors will have to immediately stop all attempts to collect debt. You will be given a case number or you can have them contact the law firm of George C. Malonis directly to verify you have filed. This will put an end to those harassing calls and letters. Stopping the harassment will help alleviate a great deal of the stress and anxiety that plagues those who are having financial difficulties. What debts WON’T be discharged if I file? While bankruptcy can essentially help you get the fresh start you need to get back on your feet and experience financial freedom once again, it will not wipe out all of your debts. This is perhaps the biggest misconception about bankruptcy. The types of debts that will not be wiped out with a bankruptcy filing include, but are not limited to, student loan debt, child support, some taxes, or court ordered restitution or fines. 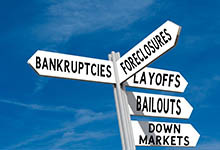 Chapter 7 bankruptcy is the most common and often referred to as personal bankruptcy. This is where most of your debt is discharged as your assets are liquidated and used to pay off what you owe. There are certain assets that can be declared exempt so you do not lose everything. Chapter 13 is the next most common form of bankruptcy filed in Massachusetts and New Hampshire. When you file chapter 13 bankruptcy, you are essentially agreeing to a court approved plan to pay back a portion of your debt within certain time frame. The timeframe to get a handle on debt and start moving toward a better financial situation is typically 3 to 5 years. If you are having a difficult time dealing with financial obligations and feel bankruptcy may be the best possible solution, the law firm of George C. Malonis is a debt relief attorney in MA & NH and can help you start the journey towards recovery. Our firm is compassionate and experienced and a good choice for Massachusetts or New Hampshire residents who need more information about bankruptcy. Once you decide to file, George C. Malonis will be there to take the reins and fight to protect you, your reputation and your financial future.